Doris Phillips Ellis, 89, passed away on Friday, August 24, 2018. A funeral service will be held on Monday, August 27, at 11:00AM at Pinetops United Methodist Church with the Rev. Jesse Baker and the Rev. Terry Williams officiating. Burial will follow in the Pineview Cemetery in Pinetops. Doris was born in Wilson County on December 19, 1928 to the late Arthur Lee, and, Mollie Robbins Phillips. She grew up on a small farm outside Macclesfield and lived all of her adult life in Pinetops with her family. After graduating valedictorian of her high school class she began her employment at Carolina Telephone in Tarboro and later, took a position as secretary with, then, Edgecombe County School Superintendent, Morris S. Clary. Eventually she joined her husband, Ping, and his brother-in-law, L.C. "Doodle" Everette in running the family business, Pinetops Furniture Company, for the next 39 years. 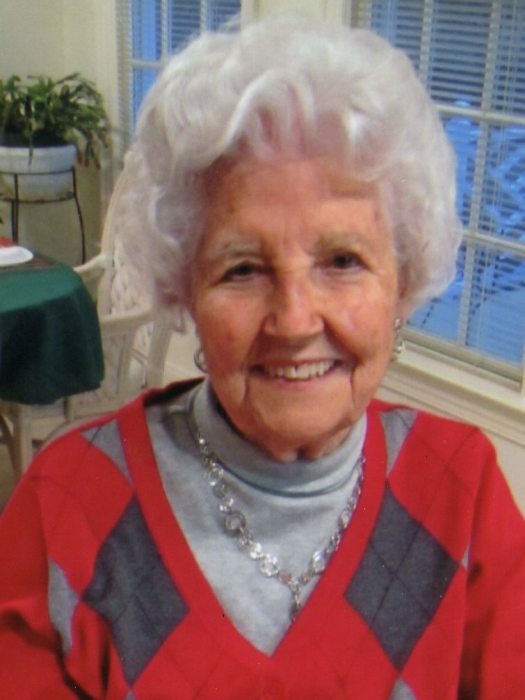 Doris was a member of the Pinetops United Methodist Church where she served in many roles including the PUMC Women's Organization, being a Sunday school teacher and enjoyed singing alto in the choir for over 50 years. She enjoyed fishing and playing golf with her family and friends. She also enjoyed traveling and sightseeing with her husband. She loved doing anything outdoors especially gardening and working in her yard which was always immaculate. She spent time working with crafts and had an extensive doll collection. Most of all she enjoyed spending time with her family and lifelong friends and will be missed dearly. Ask them what they remember most about her and they will tell you it was her warm, beautiful smile. In addition to her parents, she was preceded in death by her husband of 69 years W. J. "Ping" Ellis and, a brother, Arthur Ray Phillips of Smithfield, VA.
She is survived by her loving family which includes her daughter, Kay Ellis Gelo, and husband Tom, of Wake Forest; son, W. J. "Jack" Ellis, Jr., and wife Brenda, of Rocky Mount; grandchildren, Brent Jeffrey Kendall and wife, Siah, of Silver Springs, MD; Emily Kendall Torres and husband Luis of Wake Forest; Timothy Alan Ellis and wife, Reagan of Raleigh; great-grandchildren, Ada Robbins Kendall, Mallory Kendall Torres, Evan Robert Kendall, and Clara Bryn Ellis; sister-in-law, Jane Carraway Phillips, of Smithfield, VA. The family will receive friends and relatives on Sunday at Carlisle Funeral Home from 6:00-8:00PM and, at other times, at the home of W. J. "Jack" Ellis, Jr. at 617 Nichole Lane, Rocky Mount, NC 27803. Flowers may be given, as desired, or, in lieu of flowers, memorials may be made to the Pinetops United Methodist Church, P.O. Box 13, Pinetops, NC 27864. Online condolences may be directed to the family by visiting www.carlislefuneralhome.com.